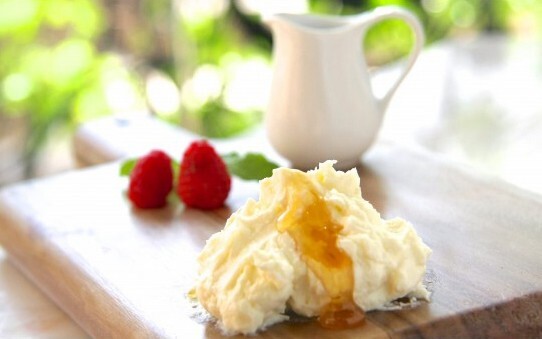 Ricotta is made by boiling whey, the liquid that remains after making cheeses. It's high in protein and other nutrients. It has a fresh milky flavor and goes well with salad and pasta. What's vital to cheese making is fresh, high-quality milk. In early 2011, they started visiting farms in Ho Chi Minh City, Cu Chi, Long Thanh, and many other provinces in Vietnam to find milk for cheeses. In Da Lat, they finally found the milk that they had been looking for: rich, fresh, and well-balanced. To keep the freshness of the milk, they even built a factory 10 minutes away from the farm. Unlike major dairy companies that buy milk from several farms and mix them together, they carefully select top-level farms and buy milk only from them to keep the quality of the products. Also, to ensure the safety of the products, they test the milk and the products at a third party institution on a regular basis. Currently, for further improvement of the milk quality, they have been working to build their own dairy farm in Da Lat. Ricotta is made by boiling whey, the liquid that remains after making cheeses. It may sound that it's a leftover when making cheeses, but actually, whey is high in protein and other nutrients and is considered a very healthy food. Ricotta cheese has a fresh and milky flavor and works great with salads and pasta. But if you have fresh ricotta cheese, you may want to try a ricotta pancake. It's made with cake flour, egg, butter, baking powder, milk, and ricotta cheese.